"There are things you don't know, that will shock you beyond your worst nightmare." 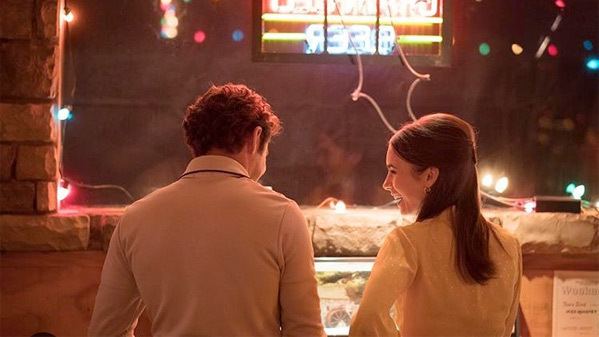 Voltage Pictures has debuted the first official trailer for the indie drama Extremely Wicked, Shockingly Evil and Vile, which is premiering at the 2019 Sundance Film Festival this weekend. This trailer is timed with that debut to bring some extra buzz to this film, which is still searching for US distribution at Sundance. This is the story of Ted Bundy, one of the most notorious serial killers of all time. A chronicle of his crimes, told from the perspective of his longtime girlfriend, Elizabeth Kloepfer, who refused to believe the truth about him for years. Starring Zac Efron as Ted, and Lily Collins as Liz, with a cast including Kaya Scodelario, John Malkovich, Jeffrey Donovan, Dylan Baker, Haley Joel Osment, and Jim Parsons. It doesn't look as dark or as vile as expected, perhaps that's the point - flipping things on its head to show us another side. 1969. Ted (Zac Efron) is crazy-handsome, smart, charismatic, affectionate. And cautious single mother Liz Kloepfer (Lily Collins) ultimately cannot resist his charms. For her, Ted is a match made in heaven, and she soon falls head over heels in love with the dashing young man. A picture of domestic bliss, the happy couple seems to have it all figured out … until, out of nowhere, their perfect life is shattered. Ted is arrested and charged with a series of increasingly grisly murders. Concern soon turns to paranoia—and, as evidence piles up, Liz is forced to consider that the man with whom she shares her life could actually be a psychopath. Extremely Wicked, Shockingly Evil and Vile is directed by American producer / filmmaker Joe Berlinger, director of the film Book of Shadows: Blair Witch 2, as well as many TV projects and lots of documentaries previously. The screenplay is written by Michael Werwie. This is premiering at the 2019 Sundance Film Festival this month. It's still seeking distribution and no release has been set yet. Thoughts?